Hvert år har den engelske kristne legeforeningen CMF et to ukers kurs om medisin i utviklingsland - trening for de som forbereder seg til å reise og oppdatering for de som allerede er eller har vært ute. Svært spennende program! Fees for the course cover accommodation and meals. Most participants are resident for the fortnight but attending for one week or for Special Interest Days is also welcomed. 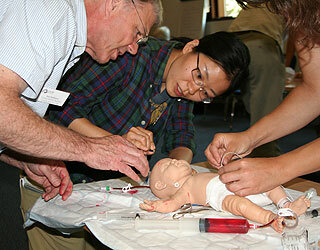 Week 1 includes paediatrics, tropical and general medicine, HIV, community medicine and cross-cultural care. Week 2 includes trauma, orthopaedics, surgery and maternal health.